A lot of research will go into every novel someone writes. Or rather, if authors intend to make their work as meaningful as possible they will do the applicable research. In my new novel (THIS NEVER HAPPENED) there is a laundry list of extremely diverse topics I felt I had to research in order to help the authenticity of the story. Some of this research time was spanning many days, while other bits only required a few relatively simple internet searches. What does it all add up to? Hopefully a thought-provoking, frightening and sometimes humorous work of fiction. We’ll see. Okay, it’s done. A few months past my personal deadline but I’ve completed the first draft of my manuscript for my third novel. Clocking at 19 chapters and ~95,000 words, THIS NEVER HAPPENED has finally happened. Next up is the editing stage, but with my style of writing (editing as I go) this won’t take very long. Editing for me is proofreading, fixing some minor grammar, tweaking some dialogue, moving ideas around from chapter to chapter until it just feels right. I don’t recommend editing as you write since it’s the best way to slow down the creative process, but I’m stubborn and it ain’t worth fixing at this point. I’m in love with some of my characters and there are definitely some favorite scenes and chapters, but I’ll share more of this in a future post. After the editing comes writing a query letter and the hunt for literary agents, which might just be more daunting than writing a 300-page novel. A few of the characters in my third novel, This Never Happened, have gone through name changes. Sometimes it’s other characters in the story who appear to fit a certain name better that precipitates a name swap. Sometimes they fall victim to the “same letter syndrome”, when two characters’ (especially main characters’) names begin with the same letter and causes confusion for the reader. As a writer you need to eliminate as much unnecessary confusion as possible. Abigail “Abi” Ayr: discovers an unexplained connection between herself and Epic. Abigail is a pathological liar and may have some rudimentary psychic abilities. She loves video games and referencing games such as Minesweeper and World of Warcraft. Margaret “Margo” Asus: An actress from The Duality of Three; played the dead girl. Was the name of the waitress at the UnDiner until I felt it was a better fit here. Her name holds a connection to the mythological pegasus, with “Peggy” or “Peg” being a nickname for Margaret (therefore Margo Asus = PegAsus). Wilma Dradtstl-Small: Epic’s mother, left them when Epic was only five years old. Practically the only thing Epic remembers of his mother is her oftentimes telling him he was “born ten thousand years too late.” But what did she mean by this? Dorothy: Waitress at The UnDiner, the Coney Island coffee shop frequented by Epic. Was Margaret Asus, then momentarily Lorna before becoming Dorothy. 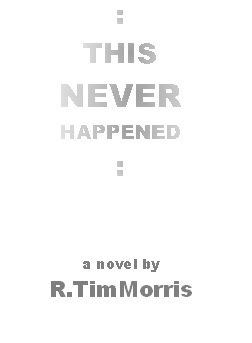 In my new novel (“THIS NEVER HAPPENED“), I’m exploring the novel-within-a-novel concept. Stop me if you’ve heard this before. It’s true, I already did this in my second book (“THE FALLING“). In The Falling, my main character (Tommy) is a novelist whose debut work (“BLANC“) was essentially a detective story set in 1940’s New York. Tommy based the detective character on himself while modelling the amnesiac serial killer he was chasing after an old friend (Patrick) who Tommy had been harboring negative feelings for. When Tommy gets it into his head that Patrick has returned after ten years in a grand act of revenge, he also decides that Patrick is using the scenes in Blanc as inspiration. I used three “excerpts” from Blanc and placed them sporadically within The Falling, at points in the story where Tommy’s feelings might be justified by the reader. But these were also scenes that intended to help readers better define the true nature of Tommy’s and Patrick’s close relationship. 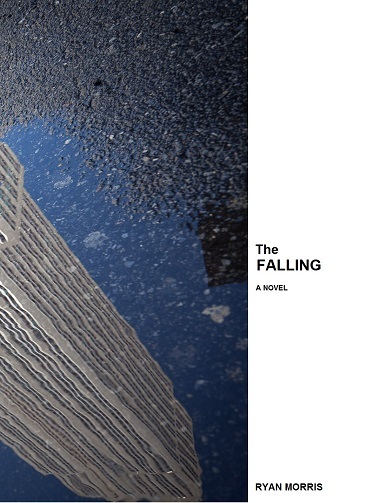 But where the fictional novel within The Falling served the story as non-linear character development, my new story utilizes the concept in a very different way. Epic begins reading the novel right there on the subway, and realizes without a doubt that this is going to be a confusing tale. It is a story about twins, though the two men (Tristan and Luca) share no relation and don’t really look alike. The fictional author (Jean Trepanier) continues to describe Luca’s physical features differently; he’s Chinese, he’s an Eskimo, he’s a little girl, or he’s morbidly obese. There’s no rhyme or reason as to why the descriptions change but the reader and Tristan and all the secondary characters are meant to simply assume they are identical twins. Luca proposes that the two men switch lives, and without much of an argument from Tristan the two swap jobs, apartments and girlfriends. The Third is written in a way and perceived by Epic to be something that is worth questioning. Is this a real book? Was it intentionally planted on that subway for Epic (and him specifically) to discover? And in another twist, when Epic discusses the strangeness of this book with his therapist (Gideon), it turns out that Gideon has read it too. But Gideon’s version of The Third is a little different: there is a whole other character in his version, one that does not exist in Epic’s: a third twin (er, triplet, I suppose) plays a key role in this alternate version, and his name is simply The Third. Why the divergences in the two books? Who holds the “correct” version? These are all questions that I’m hoping readers will ask, but ultimately, the two copies of The Third play a key role in the bigger picture of This Never Happened. They serve as clues towards the secret within the entire story. Still transitioning from the outline-to-writing stage, my goal is to have This Never Happened completed at the end of 2014. In an effort to share some of what I’m currently working on, here is an excerpt from the beginning of Chapter Four of my new novel, THIS NEVER HAPPENED. Our protagonist, Cepik “Epic” Small, is a lonely soul, lost in New York (Coney Island specifically) and searching for his proper identity. He has recently began sessions with a new therapist (his previous therapist killed himself) and he’s had brief but strangely significant encounters with an mysterious as-yet-unnamed girl. Here, Epic is riding the subway on his way to work. So read on! Comments are very much welcome. Every time I ride the F-Train I feel lucky. I don’t know why that is exactly since I don’t think good luck has ever befallen anyone who’s rode the F, but inevitably I will catch myself thinking, “This is the day something special will happen.” Because of this, I don’t take the F-Train very often; in fact I avoid it as much as possible. Because too much good luck, too much eager anticipation for something unknown cannot be healthy. And how likely is it that good luck could be a constant anyway? That goes against the very idea of luck. Maybe it’s something akin to this pleasure delaying, like Doctor Gideon said to me yesterday. Still, based on the alarming fashion in which this train shook upon leaving the station there was certainly no reason to believe good luck was on its way. There’s a delicate electricity in the air tonight, a feeling like if one were to tread ever so far from where they were meant to be sinister events might unfold. The clear summer twilight seems to hide dark clouds beneath it, rather than the other way around. Yet the rancid, musky odour of the Coney Island station greets me as it always does, smacking all my sense at once. Sure, it’s still comforting in a way, but I feel like I need to put myself outside of my comfort zones (again, as Gideon suggested) so I find a seat in the open and across from another passenger, in fact the only other person in view, rather than a shady spot in the corner of the last train. The old man ignores me, he of the two-piece checkered suit and ascot, looking like Al Pacino from The Godfather. On his feet he showcases a pair of worn bowling shoes, one noticeably larger than the other. His left arm rests upon a massive garbage bag on the seat beside him, its contents unknown but enigmatic. The deviant smile on his face captures me for a moment; why is he smiling so? I want to keep staring, but I know I’d be utterly defenseless should he make sudden eye contact with me. Thankfully my hand glides against a newspaper beside me, which is enough to turn my attention elsewhere. Tonight I’m riding the F-Train to Roosevelt Island. I’m meeting Bester, a coworker of mine, at The Salt Mine, a trendy new restaurant on Roosevelt’s Main Street. The small island, slivered between Manhattan and Queens has a dark and dirty history of penitentiaries, lunatic asylums and holding pens for victims of Smallpox. But today Roosevelt Island is slowly transforming itself into the latest of New York City’s gentrified neighborhoods offering luxury condos for a young, affluent demographic. I was supposed to pick up the company van from Bester at our warehouse in Gowanus but he called asking me to instead meet him on Roosevelt Island. There’s something wrong with the van. I don’t know the first thing about the inner workings of my single-slice toaster, but Bester apparently thinks I’m the company’s newest expert on vehicle repair. My guess is he did a little weed-induced off-roading through Queensbridge Park in the van beforehand and simply requires an alibi before filling out the night’s routine paperwork. I figure as long as he’s spotting my subway fare it’s all fine with me. The copy of the Daily News beside me seems to have gone untouched, as if the Sunday edition had been delivered directly to this seat. I catch the words “Coney Island” right on the front page in big, bold serifed letters. There’s rarely ever front page news about Coney Island, and if there is it’s only because of a tragedy. I remove the newspaper for a closer look. Apparently there was a homicide yesterday, it happened during the Mermaid Parade, just a few blocks away. I try to recall if I heard sirens or screaming, but it’s almost like I wasn’t even there yesterday, like Gideon had me under hypnosis or something. There are no names or much in the way of description, sensationalistic journalism at its best. A man in his late twenties/early thirties was strangled with his own shirt. He was discovered by a homeless man in an alley, who had probably wondered at first who had taken over his turf. I think again about how long it’s been since I’ve talked to my father; he probably isn’t worried about me, but I remind myself that I really do need to call him one of these days. The next few pages are of no real consequence. I glimpse over them as the train stops at Avenue U Station. A penguin at the Central Park Zoo that was believed to have died yesterday was now miraculously alive again. Some gibberish about a coma-like condition called cerebral hypoxia. Hypoxic hypoxia or some such thing. Simply glancing over the article doesn’t give me any glaring insight, nor do I really find it interesting enough to read deeper. The rest is so mundane it seems the same stories have been printed over and over again. Effortless stories for the simple sake of daily dissemination; a sewage pipe burst in the Upper West Side; a new dog park opens in the Village; Hampton green tomatoes may reduce cervical cancer. By the time my train reaches Avenue N Station, I’ve already tossed the paper aside, without bothering to fold it back neatly into its once pristine condition. On the seat there is now a book which I hadn’t spotted when I took the newspaper. I almost wonder if somebody left it beside me as they passed by, but I’m confident in my certainty that no one other than the gentleman across from me had been in this car. It is a novel, a softcover and dog-eared in its condition. I pick it up, and it feels only slightly heavier than I imagined, just enough to seem significant. The novel is entitled The Third. The cover is a painting of two identical left forearms, with their wrists facing out. Somebody has defaced the cover with a bright green marker, having drawn juvenile slits along the wrists with blood streaming out. Like they are bleeding pesto or possibly belong to some sort of space creature who has assumed the form of a man. Checking the front matter, I discover this is an English translation of a French novel by the author Jean Trepanier, first published in the Seventies. This translation was published a few years after that. The back cover offers no synopsis, no indication of what the reader might be in for. I’ve been meaning to read a new book so without any consideration I simply open the novel to Chapter One and start reading as the F-Train disembarks from Avenue N.
The writing is by no means extraordinary, but this may be due in part to the English translation or maybe Jean Trepanier is simply a poor writer. Or possibly both. Right from the start, the novel does not seem so out of the ordinary. It is about a young man named Tristan Montminy. Tristan is a Parisian university student who also works part-time in furniture construction, but I get the feeling that what he does is not actually important. I’ve always wondered how writers decide to craft their stories. Obviously not all information in a book is relevant to the story but where do they decide to plant the clues about what really matters? Clues about where the tale is truly headed? The book opens with Tristan in the middle of building an oblong kitchen table when his girlfriend Emilia shows up in a huff. She is pissed at him for something he doesn’t even remember doing, but he’s not too worried about it; he’s been forgetting things lately anyway, presumably a result of all the marijuana he’s been smoking. Trepanier then takes us on a two-page journey to Tuscany, where Tristan and Emilia once took a trip together and came home with a wooden vegetable crate full of pot. After a brief and fruitless argument Emilia exits, just as abruptly as she entered. From there, Tristan continues his woodworking, now with the author inexplicably going into great detail about the grain and the color of the wood. Seriously, there’s nearly four pages of description here. I look up from the book: the F-Train has stopped at 42nd Street/Bryant Park. Only four more stations until Roosevelt Island. The old man across from me is still smiling at nothing in particular. If only I could find the strength to ask him what kind of prescriptions he might be on because it’s definitely not what I’m taking. As the train starts off again I continue reading. Tristan is on his way to class, though there’s never any mention of what classes he’s coming from or going to. Upon entering the lecture hall, Tristan stops. He suddenly recalls a dream he had one week before; a dream he did not remember until now. However, the reader is not privy to the details of this dream, which I find irksome. Tristan is soon snapped out of his reverie when someone calls out. “Luca!” they shout. “Hey, Luca!” Tristan looks around and spots a stout young man he doesn’t recognize. This person is most certainly waving at him. “Luca! What are you doing here?” he asks. It takes my brain a few seconds to register hearing that we just left the 21st Street/Queensbridge Station. What? How did I miss my stop? The old man is gone now too, probably having exited the train while my attention was caught between the pages of the book in my lap. The next stop is Jackson Heights, a fair extra distance from where I want to be, and I sit on my own the entire way there. I fold the corner of the page I’m at in The Third and watch a darkened Astoria and Woodside pass by the window. The subway is so close to a few buildings that I can see the details of the lit apartments. Tiny slices of unknown lives flicker by, not unlike a film reel, almost animating the goings on inside. Mostly just televisions tuned to the same channel. The lonely blue light is so hypnotic that I almost don’t realize the train slowing down. Slipping the copy of The Third into my bag I exit the eastbound station and run the gauntlet over to the Manhattan-bound side, barely making it in time for the next F-Train. I scramble through the swarm of commuters spewing from the train and find a spot, again in the middle car. There’s some bug buzzing around the tip of my nose and when I try to brush it away it hovers around my left ear, humming its maddening song just for me. Then into the right ear. As I swat at the thing maniacally I almost miss the girl outside the window. She must have just gotten off as I went the other way. I know for sure that it’s the same girl I saw during the parade yesterday, still in the same clothes, still wearing the same sunglasses. I can clearly see a skull-and-crossbones pattern on the back of her denim jacket. Although shrouded by the eye wear, I can tell she recognizes me too. That, or she just might have a staring problem. It’s the same look from across the street as the day before. I don’t even have time to raise a hand or nod in mutual recognition before the F-Train rattles off and the girl disappears back into a faceless crowd.